For fixing or repairing broken carpet seams or awkward doorway joints. Approx. 90 cm long extra wide cover plates in either Aliminium or Brass effect. 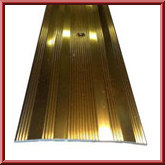 Extra wide Threshold cover plates suitable for joining carpet to carpet, carpet to vinyl etc. Available in two finishes either polished aluminium ideal for the more modern household or the more traditional brass effect. They come in 35" lengths, with counter sunk pre drilled holes. When choosing the colour of your threshold plates remember to match with existing door handles and light fittings. 7 Lengths is enough to cover the doorways of an average sized house. Made to the highest specification by Interfloor uk one of the biggest flooring accessory manufacturers in the country. We also now supply 8ft lengths.